Isn’t this such a cool idea? 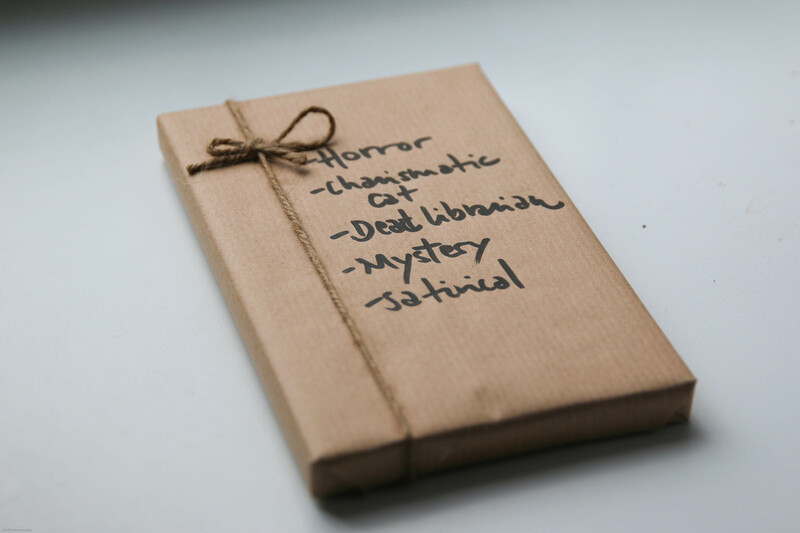 Books wrapped up in ordinary brown paper and twine, with a few keywords scribbled on the front. The ISBN number is written on the back (for the cashier’s reference, presumably), so I suppose you could technically look it up and find out what book it is. But why spoil the fun? I honestly think this concept works not just for Valentine’s Day, but for any occasion or event. It works not only as a little surprise treat for yourself, but also as a gift for someone else! So enamoured was I with the concept, and being the easily-duped customer I am, I bought one for myself. When I proudly showed my purchase to The Mister later that evening, he just laughed and remarked at how I’m such an easy target for gimmicky marketing. He mumbled something about selling ice to eskimos or something or other. I haven’t the slightest clue what he was on about. Which book did I choose, you ask? A satire in the form of a horror-mystery featuring a dead librarian and a charismatic cat. How could I just leave it there, sitting in the book shop? It had to come home with me. I haven’t opened it yet, though; keeping it a surprise for a little bit longer. I want to see how long I can wait. Which book do you think it is? This entry was posted in Blog and tagged Basel, books, gifts, reading, Valentine's Day. Bookmark the permalink. I want to do one of these but I don’t know where it is. Well this particular one was in a bookshop in Basel, Switzerland. One of the customers who was browsing alongside commented that she’d seen something familiar in the States. Maybe you could check out the bookshops in your area?